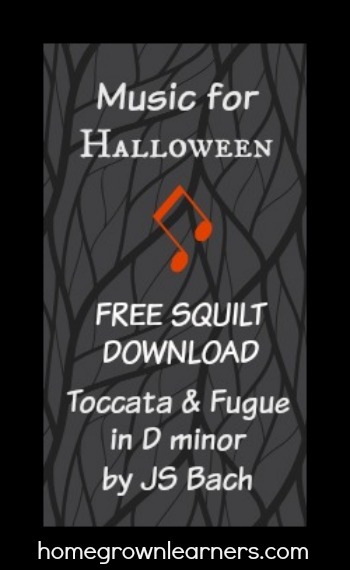 I have a FREE SQUILT lesson for you! 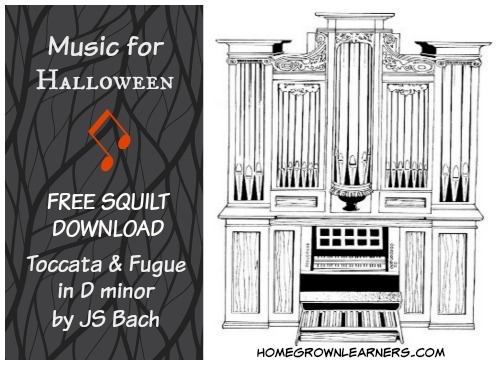 This Toccata & Fuge in D minor was written by JS Bach for the pipe organ. It is perfect to use during the Halloween season -- or during ANY time for that matter. JS Bach is a composer all children should learn about, and this piece is probably the one that engages children immediately. SQUILT lessons are designed to be EASY. They are music appreciation lessons that pack a punch - lessons that take no work from the parent, but will have lasting impact for your children. Give this lesson a try! If you like it, please visit SQUILT Music Appreciation, where you can find a full listing of volumes of available, as well as samples of each volume. If you would like to extend your study of JS Bach, I highly recommend reading Johann Sebastian Bach - the Story of the Boy Who Sang in the Streets. This is a FREE download for Kindle!